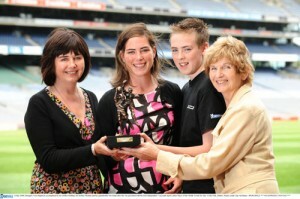 Nora Stapleton is the Lucozade Sport/Irish Independent Player of the Month for June. The 25 year old played a crucial role in Donegal’s superb victory over defending champions Armagh in the first round of the TG4 Ulster Senior Championship. The Na Fianna midfielder has been a stalwart in Donegal’s recent revival and is determined that this will continue through the All-Ireland qualifying rounds, following defeat to Monaghan in the Ulster semi final. “We seem to be the team that always gets beaten by a point. Our loss to Monaghan was a big shock as we wanted to get to the Ulster Final, but as soon as the match was over we were concentrating on the fact that with just 2 more matches we’re back in the quarter finals. We’re improving with every training session and we’ve played Kildare before so we know how they play and we’re familiar with the individual players,” said Stapleton. 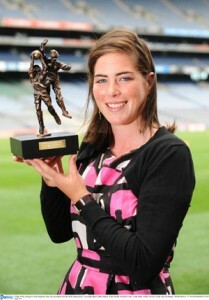 Upon receiving her award in a ceremony at Croke Park today, Stapleton paid tribute to her fellow Donegal players and management team.